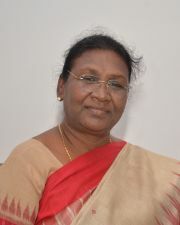 The present Governor of Jharkhand , Smt Droupadi Murmu, is the first woman to hold this office. She took the charge of Governor on May 18, 2015. She has had an impressive political and social career spanning almost two decades. Prior to that ,she had a fulfilling service career. Daughter of Late Biranchi Narayan Tudu,Smt Murmu was married to Late Shyam Charan Murmu. She has one daughter. A two – time member of the Legislative Assembly , Murmu is a former minister from Odisha. Smt Murmu’s political career started in 1997, When she was elected as a councilor and later became the vice chairperson of Rairangpur NAC. In the same year , she became the vice president of a national political party’s Odisha ST Morcha, and later, its president. In 2013, she became the national executive member of the party’s ST Morcha. In between , in 2007, she was awarded “Nilakantha Award” for the best MLA of the year’s by the Legislative Assembly of Odisha. During her expansive political career, Smt Murmu had also been a pro active pursuer of social causes and played a pivotal role in community uplift in Odisha. 2007 Awarded as "Nilakantha Award" for The Best MLA of the year 2007 by Legislative Assembly of Odisha. 2000-2004 - Member of Legislative Assembly, Rairangpur ,Odisha and became Minister of State (Independent Charge ), Govt.of Odisha.